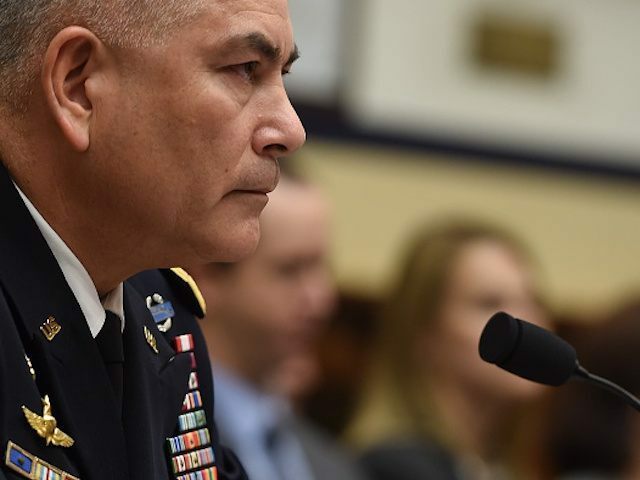 “I have the authority to protect our coalition members against any insurgency — Haqqani [Network], Taliban, al Qaeda — if they’re posing as a threat to our coalition forces,” testified the commander, Gen. John Campbell, before the House Armed Services Committee. The general’s comments came in response to Rep. Jim Bridenstine (R-OK) asking if he had the authority to attack the Taliban, which has stepped up attacks since the end of 2014 and has been linked to the deteriorating security conditions in the Afghanistan. “It is astonishing that we have an authority to go after the Taliban and the president is preventing us from doing that,” proclaimed Bridenstine. The Oklahoma Republican argued that the Authorization for Use of Military Force (AUMF) 2001, passed by Congress and signed into law by the U.S. president at the time, grants the top commander the authority to use the necessary force against the Taliban. President Obama declared an end to the U.S. combat mission in December 2014, marking the beginning of the train, assist, and advise (TAA) role for the American troops on January 1, 2015. While testifying, Gen. Campbell noted that with only 9,800 U.S. service members in Afghanistan, carrying out the TAA mission is difficult. At least 21 American service members have been killed and another 79 wounded since President Obama adjusted the mission so that U.S. troops are unable to attack the Taliban from an offensive position. The majority of the total 2,227 American military deaths and 20,109 injuries since the war began in October 2001 have taken place under President Obama’s watch. Rep. Bridenstine quoted the Authorization for Use of Military Force (AUMF) 2001. “That the President is authorized to use all necessary and appropriate force against those nations, organizations, or persons he determines planned, authorized, committed, or aided the terrorist attacks that occurred on September 11, 2001, or harbored such organizations or persons, in order to prevent any future acts of international terrorism against the United States by such nations, organizations or persons,” states the AUMF. The Taliban has been accused of providing safe haven to al Qaeda members involved in orchestrating the September 11, 2001 attacks on the U.S. homeland, including the late jihadist leader Osama bin Laden. President Obama is currently expected to reduce the U.S. military presence in Afghanistan to 5,500 troops by the time he left office in 2017. “We’ll have a very limited ability to do TAA with 5,500,” said Gen. Campbell, who signaled that the U.S. military will stay in Afghanistan for years beyond 2017. Obama has nominated Army Lt. Gen. John Nicholson, Jr., to replace the outgoing commander. President Obama has been hesitant to call the Taliban a terrorist group.